We all need a friend! Are you finding a friend for your cat? Let Cheltenham Cat Rescue help you! Lonely cats and kittens are prone to becoming little mischief makers when they are left to their own devices. So why not find them their very own bestie? Having two cats is actually far easier to manage than having just one. Once they have grown accustomed to one another, the pair of besties will take comfort in each others company. The task of introducing two cats can prove to be a tricky one at the best of times, however, it does largely depend on the temperaments of the cats and most of all how slow you take the process. If you take the introduction slowly and with a lot of love, treats and toys, your new kitty and existing cat will be best friends for the rest of their days. The process of introducing a resident cat to a new family member must be executed in stages in a neutral territory. One of our CCR representatives will help you along the journey as well. 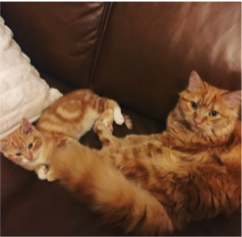 Greta had her gorgeous 7-month-old kitten Hello and knew she had to find Hello a friend. That’s where Stripe came into play, now named Goodbye. (hahaha, we love the name change! It is very fitting). Hello and Goodbye do just about everything together, from playing to snuggling. CCR wishes to extend our joy, happiness, and thanks to Greta. Welcome to the CCR family and please keep us posted on all your family adventures. Our team is so happy for you guys, we are so grateful that you found us and know we have found the best forever home for Goodbye. I have a 7-month-old kitten already, and her name is Hello. So, I have renamed Stipe to be Goodbye. Hello and Goodbye absolutely love each other. It took a couple of days, but now they follow each other around 24/7. They sleep curled up together and are super sweet with each other. They do play like crazy kittens, chasing each other around my house like nothing I’ve ever seen. But it’s all fun. So, thank you for allowing me to adopt Goodbye (Stipe) and please pass on my thanks to his foster carer for raising him to be such a sweetheart. Are you finding a friend for your cat to bring extra warm fuzzy lovey dovey feels to your home? Get in touch with us, we have plenty of cats and kittens looking for their forever homes and would love to meet you today. View all our Cheltenham Cat Rescue cats, consider adopting one of these love bugs and join our CCR family.